I'm publishing an extra post this week. Need to... in order to catch up. You see, a couple of weeks ago - maybe even more 'cause as you know, time flies... just like the birdies - something happened. I had been tagged and I didn't even know it. Can you believe it? You'd think that a cat like me - one with two adorable healthy ears like mine - would have heard it when Caren & Cody over at Cat Chat said "you're it!" But I didn't... sorry... the peep even checked my ears for mites. Nothing there. I just didn't know there was a game of tag going on, I guess. That's the only reason I can think of. Thankfully, Caren & Cody let me in on it. Boy, did I ever feel silly. Don't tell anyone but... I'm blaming the peep. #1. Describe yourself in seven words. I live with eleven other cats. Someone is ALWAYS bound to be up. The next thing you know? There's a tail in my face or a paw on my head. It happens. indoor plumbing. Yup, I'm talking about the litter box. so much I don't know. And it's not like the peep is much help. She's worse at it than me! Eventually, I'll figure it all out. After all, I'm a cat... and cats are smart. kind of super duper extra potent nip. And those of you who know me, know I love the nip. there is bound to know. opposeable thumbs? I'm pretty sure that with opposeable thumbs, I could take over the world. blanket but I'm opposed to falling off things so.... I guess I'm sitting on the fence on this one. the first place. I'd hate to think I had upset them. But they're so great, they weren't upset at all! Now, some of you may have played this game before. If you don't want to play again, that's okay. It's also okay if you'd rather just go and have a nap or some treats. I understand... really. But... if you wanna play... well.... then... YOU'RE IT! Hi Nerissa! Thanks for visiting my blog and taking a peek at my red wagon and toy collection (well - one of my collections anyway). I liked your "tag" responses. That's a fun thing to do isn't it? We know Caren and Cody too - in fact I THINK we tagged them! LOL We signed up to follow your blog...looks like you follow alot of the same ones WE do! It's fun to be part of the kitty blog family isn't it?!?!?!?! You'll soon get used to everything as you go along Nerissa - just go with the flow and a whiff of nip! Thanks Nerissa furr Tagging uzz, we lovezz a good game! Yaaay ! Go see our bloggy! I'm Sundae - the resident cat here at These Days Of Mine. 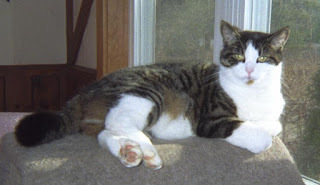 My mom found your blog over at One Spoiled Cat (by the way, Sammy and I have a "thing" going). Nice to meet you - I'll be back to visit! I really enjoyed your answers and I think the home grown nip idea is a great one! Thanks for the tag too sweet friend! Loved your answers. that silvervine has us interested too, we're thinking of ordering some. Wish you a pawsome weekend !! Allie: *wiggles pink toenails* HIIIII Nerissa!! FaRADaY: Mowzers, those are pawesome answers! Maxwell: We sure enjoyed getting to know you - we're so glad you gotted tagged! that is a very sweet picture of you !